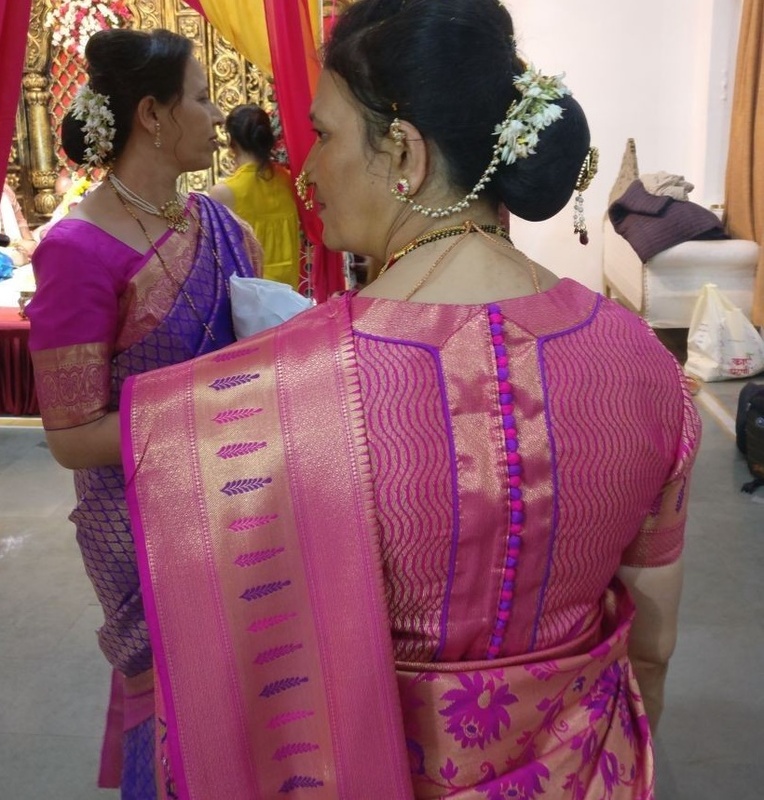 Indian women love their sarees and when they get married they are gifted with loads of sarees by relatives, friends and ofcourse their own mom. Majority of Indian brides have atleast 30-50 sarees packed in their trousseau and how many does a newly wed bride actually end up wearing? 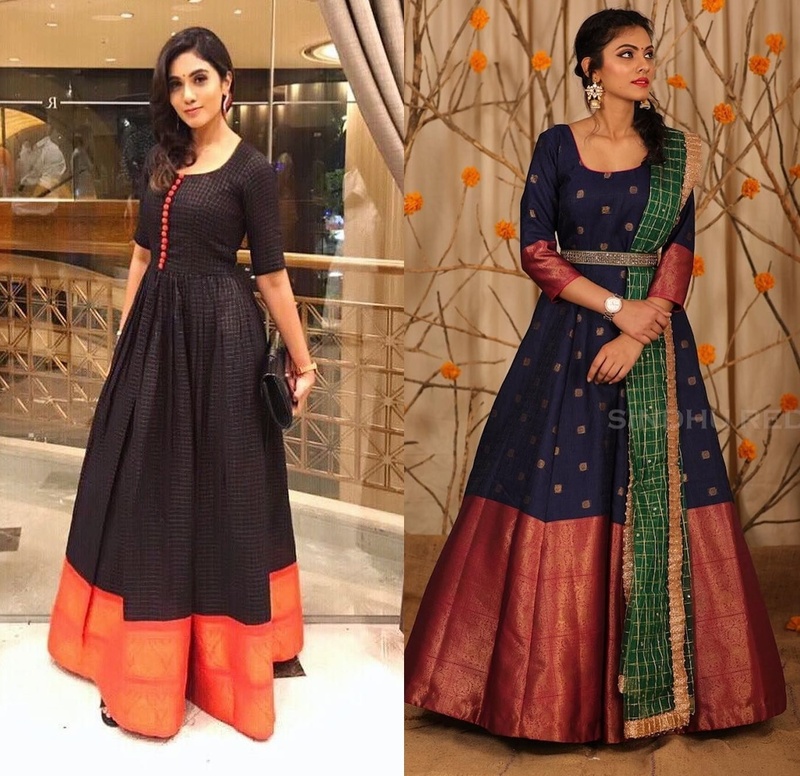 Not many because new trends keep surfacing every season and the ethnic wear market keeps coming up with new silhouettes, contemporary patterns and styles which women prefer over the traditional saris. So, what do you do with this almost new saree overload lying in your cupboard? You find innovative new ways to re-purpose or reuse them! 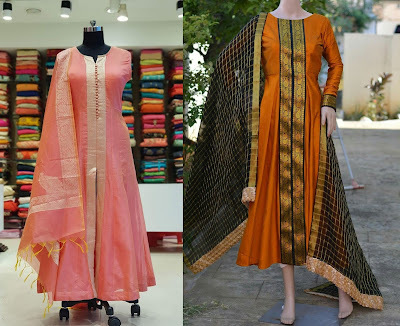 Reusing sarees as kurtis is a very budget friendly idea to get a new look to your old sarees moreover working women these days are going to wear kurtis way more than sarees so you get most out of your outfit. 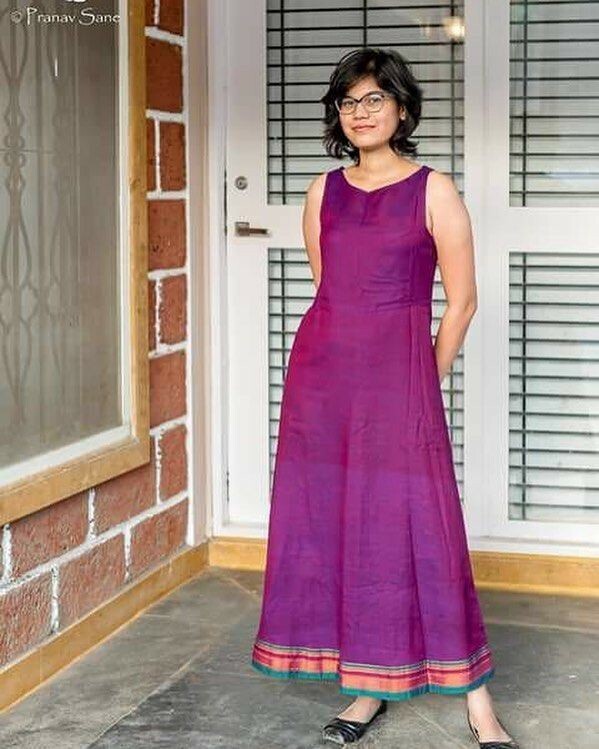 Why reuse saree and convert it into a kurti? Have an old saree from your grandmothers era and want to treasure the memories? 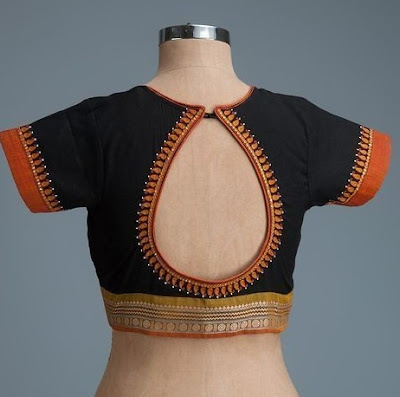 Make a kurti out of it. Wear it to your haldi or mehndi to feel her presence in your wedding. It is eco friendly too. 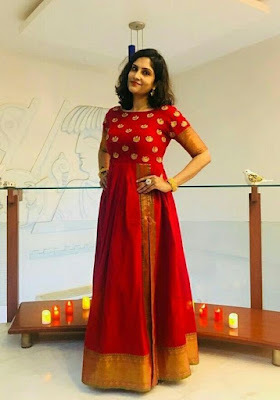 Make the most out of saris lying in your wardrobe by re purposing it into custom made kurti which your can wear to weddings, festivals or even daily wear. Here I bring to you some inspiration in the form kurti designs which are well suited for being made from old sarees. 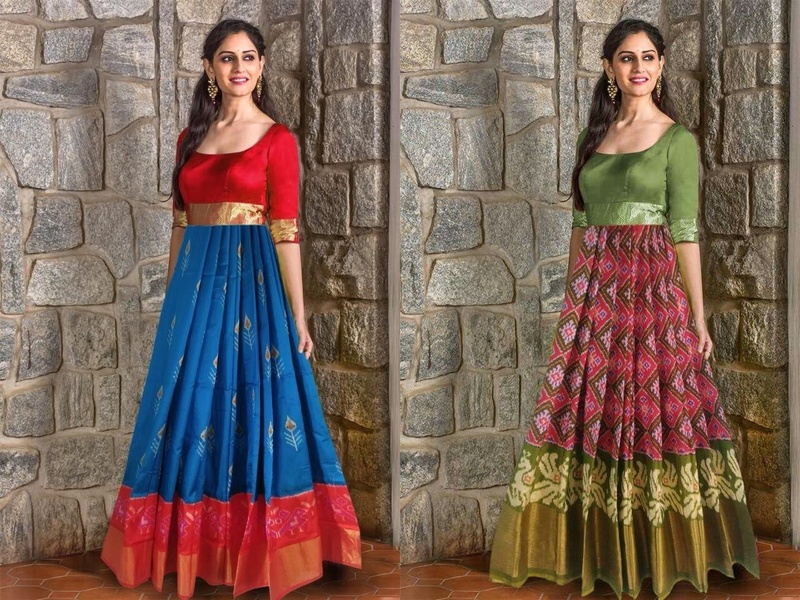 Convert your old silk saree into a gorgeous looking anarkali dress which you can flaunt at weddings, parties or even festivals. 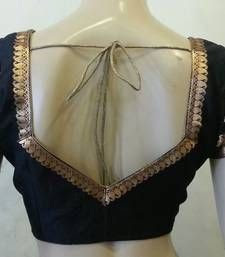 Silk sarees work best for anarkalis but you can try plain sarees or sequined net sarees too. 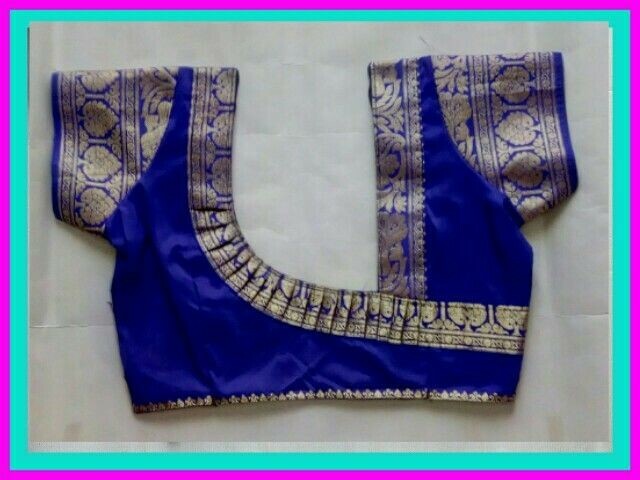 Use the saree border for as lace for anarkali border and go for a contrasting bust area for a more designer loook. 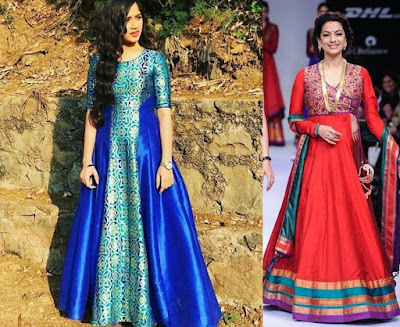 You can use two different sarees to get one anarkali stitched for both yourself and your daughter as matching mom daughter outfits are super in vogue these days. 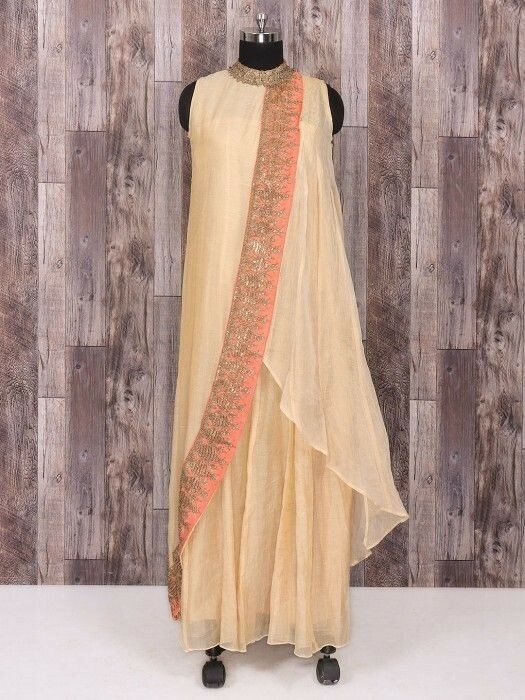 Use the pallu of saree like a dupatta and pair with matching leggings or get churidaar pants stitched. Straight cut kurtis are the most sought after desi outfits in todays times since they work well for casual as well as formal wear. Brocade, kanjeevaram or printed sarees can be used to make long kurtis which you can pair with patialas, leggings or even palazzo pants. Even plain sarees in silk, velvet or satin can be used for this purpose and you can customize the sleeves as per your style preference for a trendy new look. Go for frill sleeves with plain saree kurtis or a mini sleeve with printed sarees and use the pallu part as dupatta. Cotton or plain sarees can also be used to make palazzo pants which give a very breezy look when paired with straight kurtis. 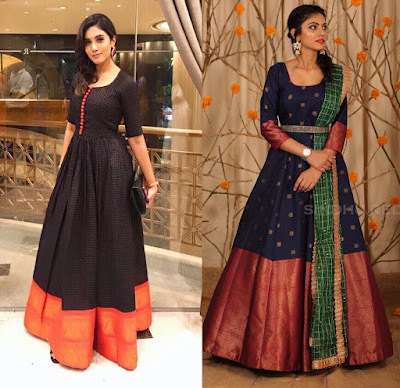 Long ethnic gowns are hot in trends this wedding season and with sarees having so much of fabric you can easily turn it into a long frock gown. Umbrella cut long gowns wouldn't really be possible with the saree with so you should ask your tailor to stitch up a kalidaar long gown and customize it with contemporary neck pattern and sleeve lengths as per your taste. 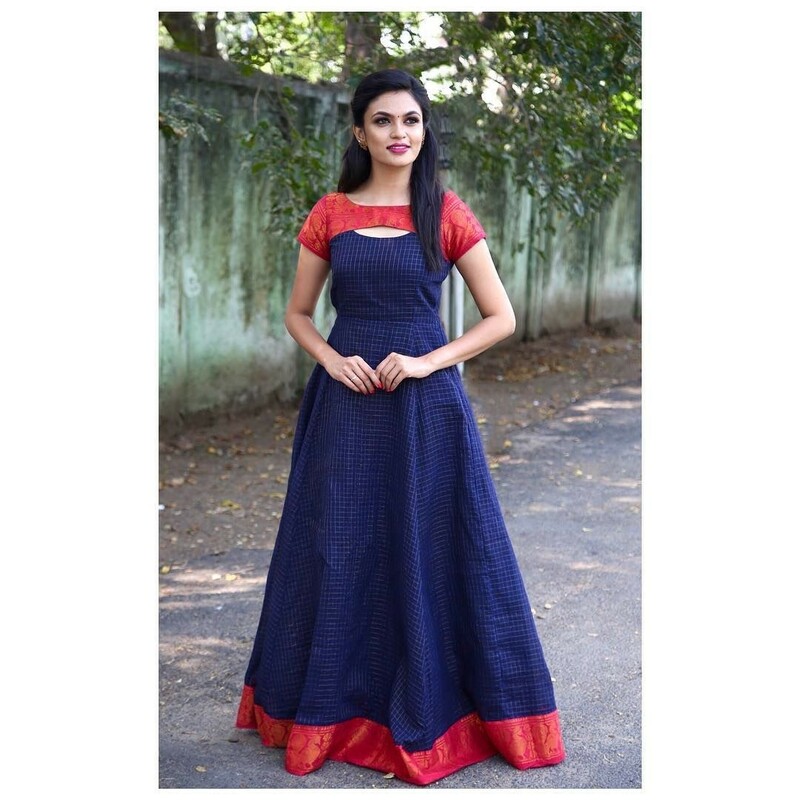 You can use net sarees, silk sarees, plain sarees or even cotton sarees for a floor length kurti gown like this. 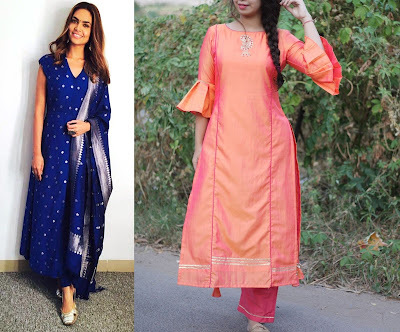 Silk sarees, cotton sarees, plain Georgette sarees all can be turned into simple straight kurtis which are ideal for daily wear. Use the saree fabric to stich a knee length kurta and try complementing kurti neck designs which makes it appropriate for formal wear. 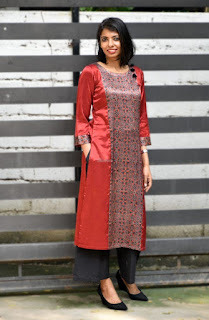 Pair kurtis like these with fitted pants or flared bottoms and skip the dupattas for a fuss free office look. 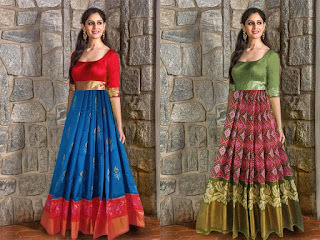 All the opulent rich pattu sarees make real pretty anarkali suits which you can wear to weddings. This is best idea to reuse sarees from your mom or grandmother's collection to tresure her memories. 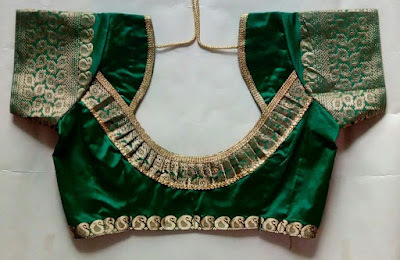 You can use a yellow or green shaded pattu saree to make a dress like this wear for your haldi or mehndi ceremony. Use borders liberally and shop for contrasting fabric for the bust area. 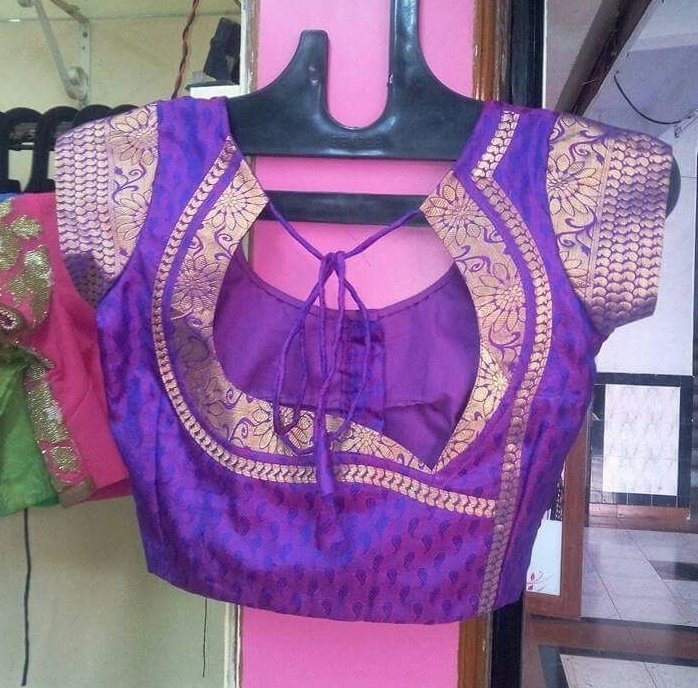 You can even use the blouse of saree for the top part. Simple sarees with borders can be used to make these gorgeous salwar suit kurti designs where the border is used in the middle to form a key design element. For bottom use something you already have and for dupatta try to contrast with another saree for a drop dead gorgeous look. Short dresses which work for casual sunday brunches? Get it stitched from pattu or cotton sarees becuase we girls an never have enough of them. A collar neckline gives it a very contemporary twist and I feel this is a must try neckline. 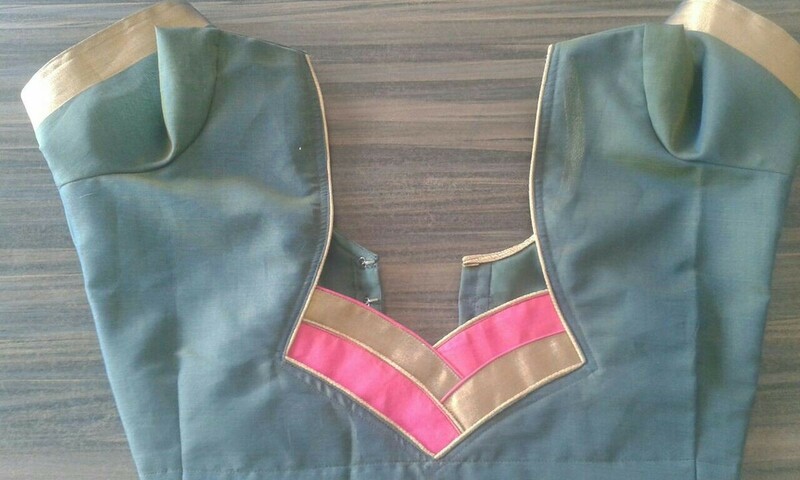 The simplest way to reuse saree is to get a umbrella style kameez made with a bit of border details. I love this idea or understated elegance you can wear daily even when at home. 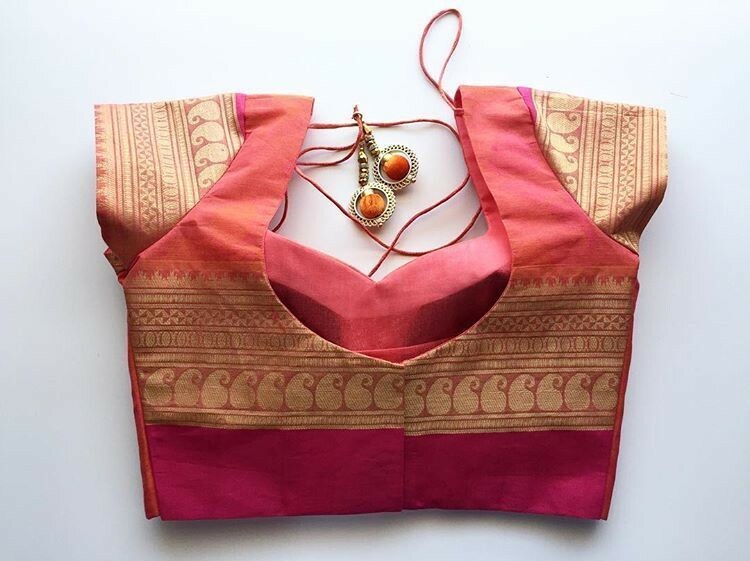 When you are reusing your moms gorgeous silk saree you want the resulting outfit to be exceptional right? Then you need to experiment a bit and make bold neckline moves like this scoop neck with an oh-so-wow back cut out. Try this with rich pattu sarees and use borders to create design drama. 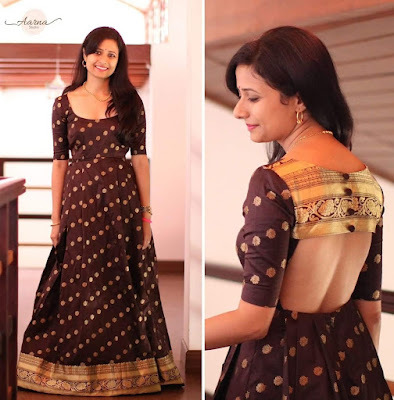 A very interesting idea where a skillful tailor can re purpose a saree into a super trendy long kurti with a middle slit. This middle slit kurti can be paired with leggings, palazzos or even jeans for a chic look. 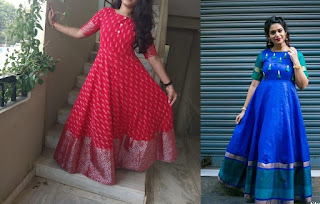 Brocade kurtis are everywhere these days , celebrities are wearing it, women are wearing it on festivals and these work even for wedding paired with flared skirts. 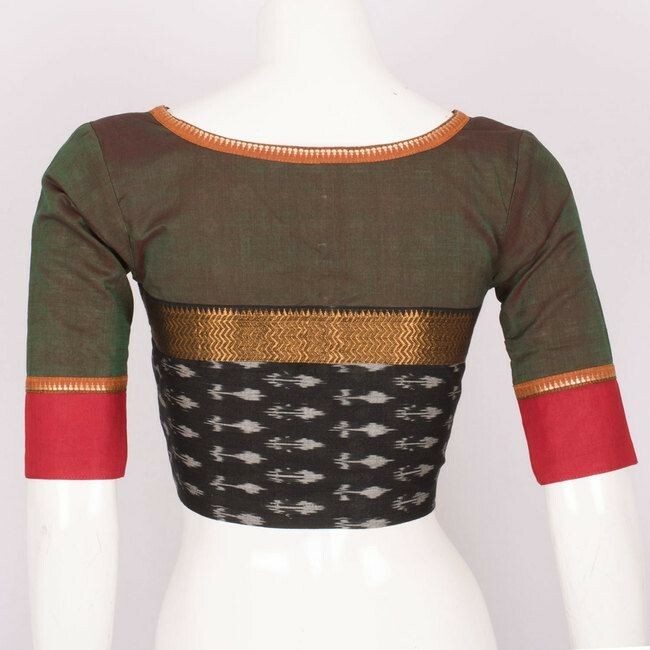 Use your brocade saree to get a long kurti stitched which you an wear to your office party or pre wedding ceremonies. Pair with cigarette pants or skirt keeping the occasion in mind and dont forget to add a plain dupatta into the mix. You can get the saree fabric attached to dupatta like borders too. 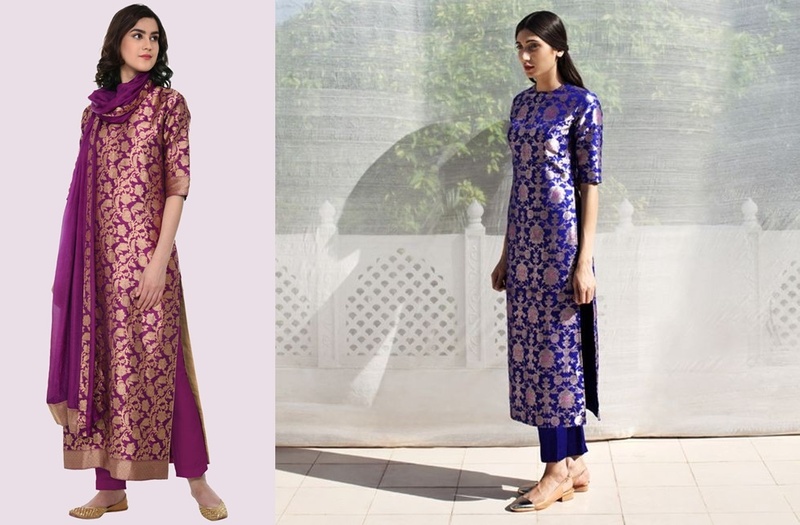 Another popular trend I have spotted is kurtis paired with brocade patiala pants which look so tradition and amazing. 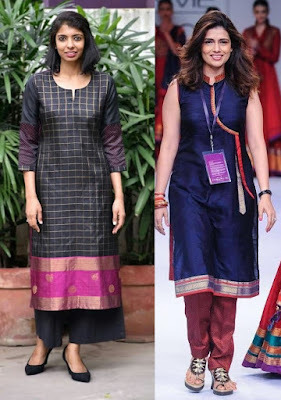 You can try this style too by getting a patiala pants stitched from brocade saree and pairing it with a kurti you already have. 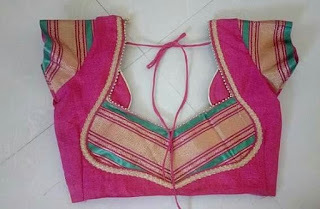 Another unique way to reuse net sarees or even plain sarees is to get a reputed tailor or botique to stitch a designer kurti for you. This overlapping collar neck pattern requires only plain fabric and some gorgeous lace border. 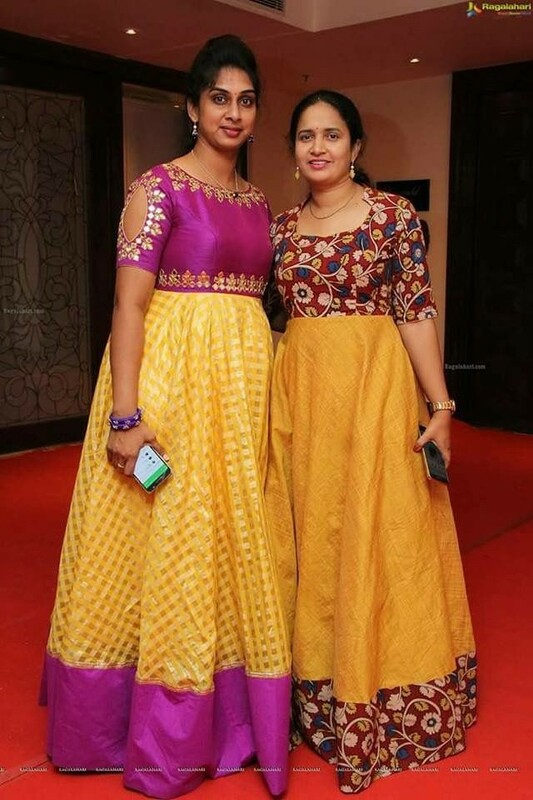 Use border of your saree or just shop for some contrast thick border in kundan or stone work and you have dream of a dress ready. 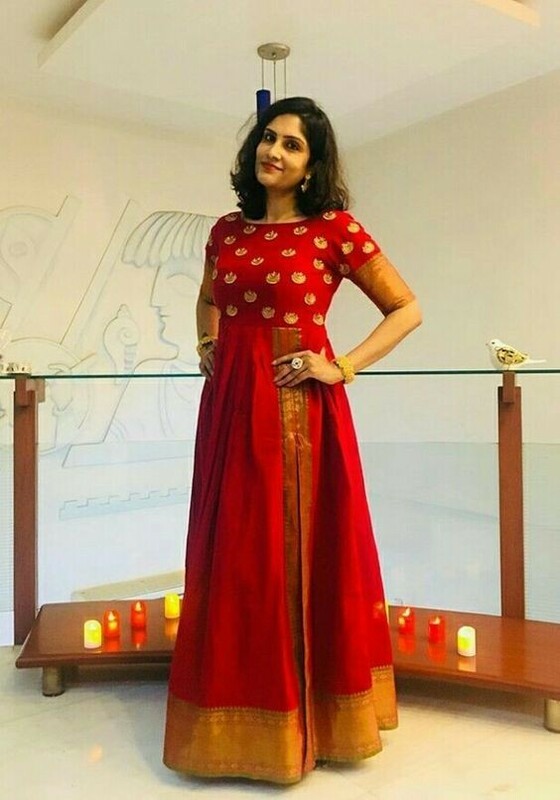 Another long kurti design you can try with old sarees is to go for a collar neckline and attach borders in middle and hemline for a festive feel. 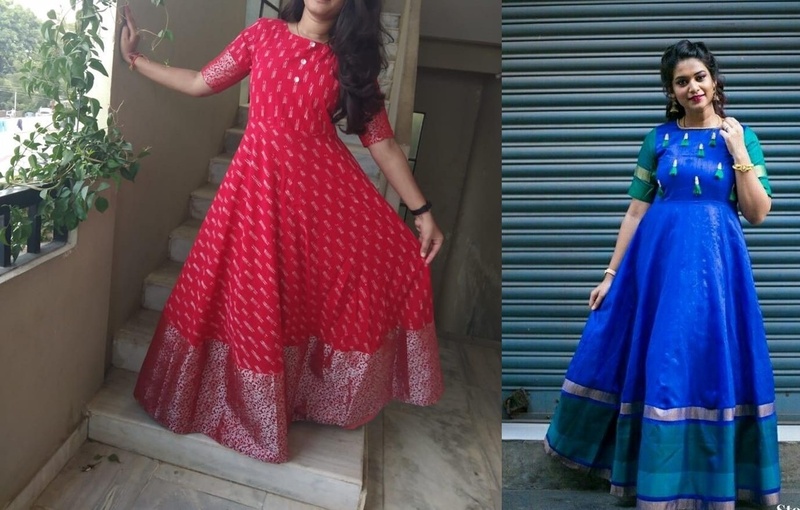 You may not have enough fabric for bottoms with long kurti designs like these so you can grab a matching colour leggings or even 2-3 meters plain crepe fabric can sort the bottom issues. Saree having huge border? Then it makes for even more ornate kurti which screams festive from all corners. Go for a long flared kurti where the border is highlight and you can add thick border even to sleeves area. Like to keep things sober and fuss free? 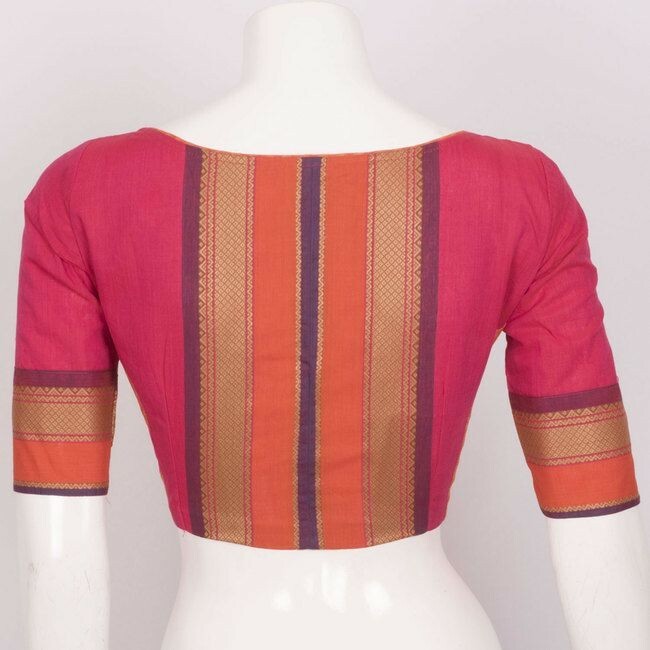 then convert your old cotton saree into long sleeveless A line kurti which can also be worn like a dress. This simple style works best for casual everyday wear for stay at home moms. A straight kameez kurti where thick saree border is used as design element in the middle also looks subtle and pretty. 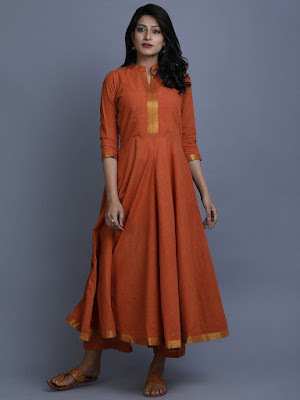 These kurtis can be worn with a variety of different bottoms like leggings, jeans, dhot pants or even salwars. A beautiful saree can look good as a gown on its own but if you are making an effort to make a custom outfit then why not make it stand out? Go for a trendy neck pattern ike a oval cut contrasting neck like this and make a statement. I have already mentioned how a saree an be turned into a long anarkali but to add more drama use the saree border and get a slit done on the side which give it a unique appeal. 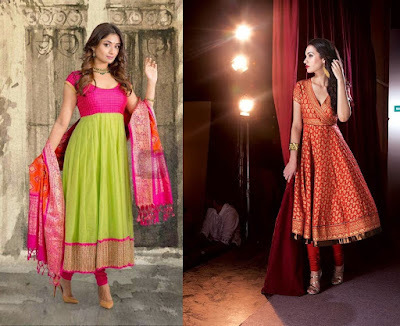 For parties floor length gowns style outfits made from old sarees are ideal. 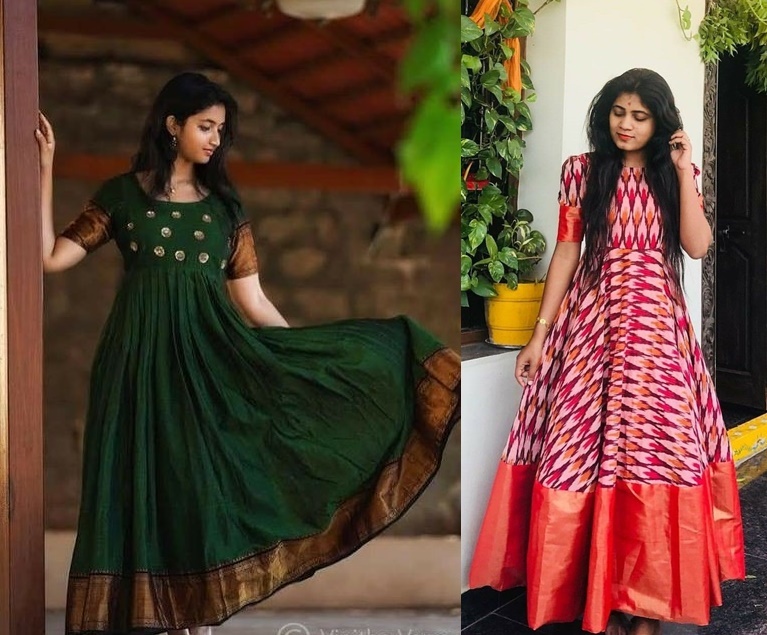 Use silk or crepe sarees with borders to make long kurti styles like these and you can go for trendy necklines with mirror work or doris to enhance the output of these frocks. 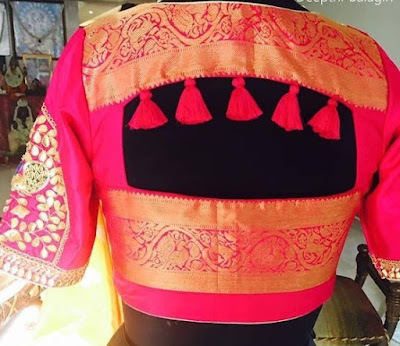 While the idea to use saree to make is to save on fabric you shouldnt forget the borders. 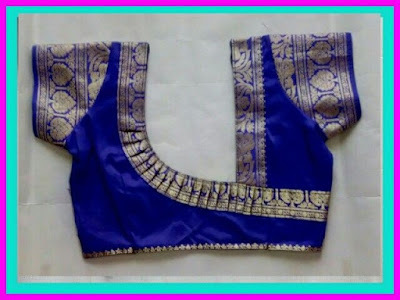 Most sarees come with gorgeous borders which when used properly make for amazing design elements. Borders can be used on neckline, hemline, sleeves or even in the middle or side slit to give design a designer feel. If your old saree has some wear and tear then best is to discard that part and use the rest of fabric for making a kurti. The damage is in border area then you can easily buy new borders to use for your kurti neckline. If buying borders go for contrast colours and trendy ones with mirror, kundan or pearl work which can elevate the whole kurti to new level. Sarees can make for beautiful dupattas, for this purpose use the pallu part which looks best with kurtis. Sarees are great way to get matching outfits for mom daughter stitched. 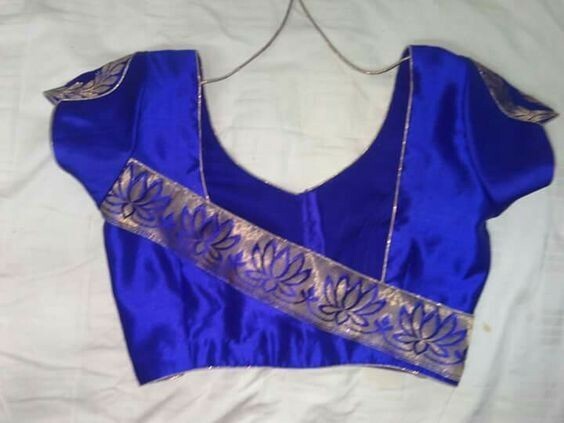 If you have your moms saree lying in cupboard then reuse it by getting a salwar suit stitched for both yourself and your daughter which makes for priceless treasure. When using saree fabric for making kurti you dont usually have enough fabric to make bottoms especially if your kurti is flared. 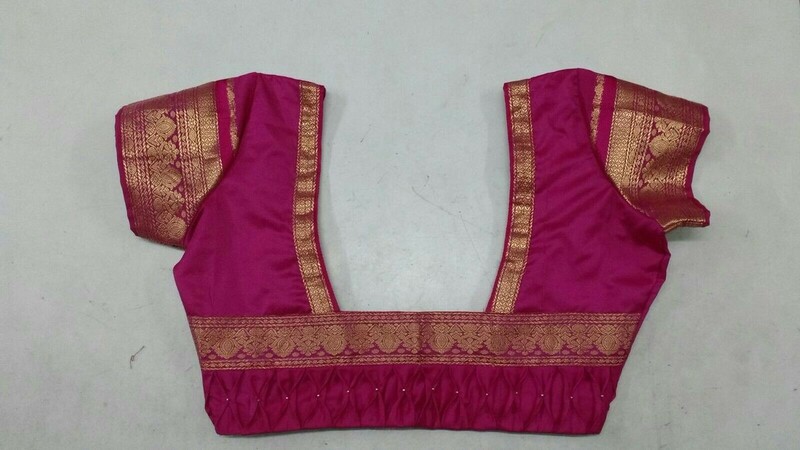 You can get contrast bottoms made from a different saree or use matching leggings as bottom wear. 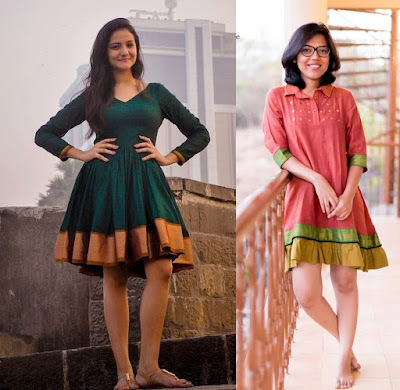 Which kurti design from old saree are you looking to try?